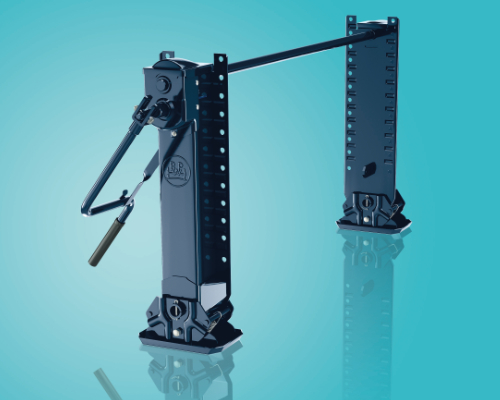 BPW's Generation 2 (G2) landing leg has been designed to meet the rigorous requirements of today's commercial vehicle operation. Building on the success of their first model introduced in 2012, the G2 has been given a new-look design and engineered to further enhance durability and safety. BPW are renowned for their uncompromising approach to quality and the G2 is no exception. One of the lightest legs on the market today, G2 has not compromised on strength, and features a reinforced lower support brace and strengthened back plate for robustness. Durability and safety have been optimised, with a new sealing system to prevent water ingress and easy gear selection. A long service life is also ensured, as each leg is specially treated with an anti-corrosion coating and by using BPW's ECO Li 91 grease, the G2 is maintenance-free for three years. The new G2 landing leg are available in a range of sizes with four foot options – compensating, flat, rocking and wheel. Reinforced lower support brace and strengthened back plate. Weight kept to a minimum with one of the lightest legs on the market today. Easy to fit. Easy to use gear system. New sealing system. Anti-corrosion coating.